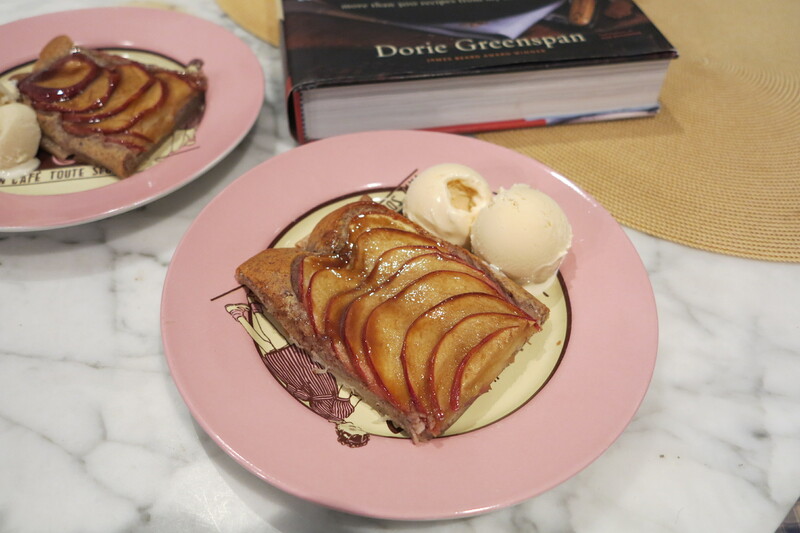 So this week’s French Fridays with Dorie recipe is actually called Crispy, Crackly Apple-Almond Tart, but since I couldn’t find filo dough I had to drop the Crispy, Crackly part and use puff pastry instead. But despite this initial setback, I was really excited about this recipe. Maybe it’s because fall is in the air, maybe it’s because I haven’t done a dessert in a while… or maybe, just maybe, it’s because apple pie is one of my all time favorite desserts and pie crust is one of my all time most dreaded recipes to prepare. Dorie’s alternative, a simple almond cream and thinly sliced apples on a filo puff pastry base sounded like an awfully promising alternative. In the end, Dorie’s recipe delivered on its promise. This was just crazy easy! The almond cream came together in minutes and then it was really just an assembly job. Yummy, I will definitely make this again. The satisfaction of apple pie without the annoyance of making crust! This entry was posted in french fridays with dorie and tagged Around my French Table, dessert, pies & tarts, seasonal - autumn. Bookmark the permalink. I’d like to try this with puff pastry now too! Looks great! YUM! I had to pass on this recipe, b/c i couldn’t find some ingredients. Sounds delicious though. I went the puff pastry route as well and really enjoyed it. I also enjoyed how simple this ended up being. Rose, puff pastry is delicious with apples, I have to agree with you there and I love the fact that you did not peel the apples before you sliced them, this way the apple slices look even prettier than peeled! P.S. :Hope that you are feeling better this week! – Have a great weekend (although it does look like its is going to be a rainy one)! Rose, Edeka does not carry phyllo dough but the Turkish fruit mongers always do – just in case you wanted to get it some time in the future (you probably knew that already though). I made mine with puff pastry too but only because I don’t like working with phyllo. 😉 Gorgeous tart you had there! BTW, I just came back from Berlin and already missing German food. Very envious that you can get those excellent soft pretzels and sauerkraut just steps from home! Totally fell in love with knackebrot. Your tart looks beautiful and delicious:) I believe I would like this recipe with puff pastry instead of using filo dough. Nice job! Love the look of your apples with the peel still on. Puff pastry is always good, too! D’oh! I skipped the almond cream and made the bonne idee instead. Yours turned out great! I want to try this with the puff pastry. I love that you kept the skins on your slices. They give the tart such a pretty color. Beautiful, Rose! I actually think I would like the puff pastry version better. And, I like that you left the peel on the apple – it adds color. I love your plates, too! Puff pastry would be so good with this tart. I think I would like it better than the filo. It was delish, and your puff pastry version looks good. That´s a sweet slice of pie! Leaving the skin on is such a great idea, it looks perfect with the ice cream! Have a great weekend! I thought of using puff pastry, nice to know it works so nicely! The skins on the apple add a nice splash of color! Simply beautiful tart! Have a wonderful weekend, Rose! “Crazy easy” is right. I think Dorie’s Bonne Idée was to use puff pastry and several others tried it and liked it also. I loved the combination of tastes. Your tart looks lovely and delicious but I hope you will use Filo dough when you make it again. The crispy and crackly is fun. and many other little tarts. Your tart looks perfect. Have a great weekend. I love the colour of the baked apples!! Beautiful!! Just beautiful, Rose! Love the teeny bit of color from the apple peel…gorgeous! I’m going to make this again with puff pastry. You make it look SO EASY! It was delicious with filo, but much more fiddly. I think this would be lovely with puff pastry, too. Yours looks beautiful. Yours looks really good! I considered going the puff-pastry route, but ended up using phyllo after all. Good to know it works with puff pastry because that looks like a much less time consuming option.